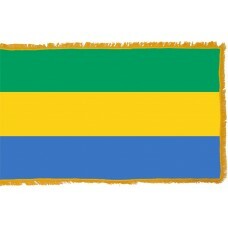 The Gabon Flag features three horizontal bands, in the colors of green, yellow and blue. It was adopted in 1960, when the country received full independence. 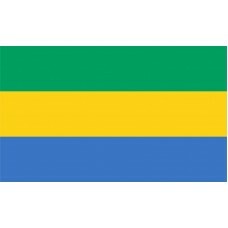 The first Gabon Flag that was adopted in 1959 used the existing colors of the flag today but the yellow band was thinner and the corner of the flag featured the French tricolor. On August 9th, 1960, the French flag was removed from the design and the yellow band was enlarged to make it equal in size to the green and blue bands. The yellow color of the Gabon flag represents the sun and the equator which runs through the country, the green color represents the agriculture and forests which make up the majority of the country, and the blue color represents the Atlantic Ocean that it lies on. In 1839, the French gained control of Gabon and it became part of the French colony and in 1910, it became part of the French Equatorial Africa. Gabon was forbidden from having their own flag by France as they feared that if they had their flag that they would try and seek independence. In 1958, following the decolonization movement in Africa, the French were obliged to grant limited self-governing freedom to Gabon but as part of the French community still. It was a year after this that Gabon adopted the first version of their flag. Gabon is a country in Central Africa that is bordered by Equatorial Guinea, Cameroon, Republic of Congo, and the Gulf of Guinea. The capital and largest city of Gabon is "Libreville" which translates as "free city." It is thought that it was the slaves that had just been freed that discovered this city in 1849. Gabon is considered to be one of the more prosperous countries in Africa due to the oil and mineral reserves that make up the majority of the country's economy. Tourism in the country has been increasing over the years, with the majority of tourists visiting the country mainly to see the animals. Gabon is home to 80% of Africa’s gorilla population. The majority of Gabon is covered by rainforests (80-85%). It is also home to some beautiful sights including the "Kongu Falls" which are the strongest-flowing waterfalls in the world. These are found in the Ivindo National Park on the Ivindo River. Gabon has 13 National Parks that were all established in 2002 and one of the popular parks (Loango National Park) is home to over 777 species of birds. Another popular attraction is the "L'eglise St. Michael" (Cathedral of St. Michael) which houses 31 wooden carved columns, each column depicting its own biblical scene and it is thought that all the columns were carved by a blind man. With its extensive range of forests, wildlife and endangered species as well as beautiful beaches and historical monuments, Gabon's economy is no longer just reliant on its oil, minerals and natural resources, tourism is now also having a big impact.